Water in oil is considered a very harmful contaminant and must be recognized and managed effectively. Ignoring water contamination can lead to internal system corrosion, valve locking, parts wear, silting of orifices and valves, oil oxidation, additive depletion, pump failures and a serious effect on the oils viscosity. There are three types of water contamination in a typical system: free water, emulsified water and dissolved water. The water saturation point of oils will vary depending on the oil type (saturation point is that point above which water is in a free form) and it is usually 200-400ppm for standard hydraulic oils, depending on age and condition. Saturation point is higher with higher temperatures. As a guide using 100ppm for an upper water limit for most systems using mineral base oils, this means all free and emulsified water and a significant portion of dissolved water must be removed. A vacuum dehydrator is one of the very few methods to remove large amounts of dissolved water above 500ppm from oil. It will also de-gas the oils making it suitable for use on transformer oils and other oils with entrapped air. Free water is separate from the oil in the system and can be visually identified in a sample bottle from the oil. The specific gravity of most oils is less than 1.00, so water usually collects at the bottom of the sample bottle or reservoir/system. For this reason, free water can easily be decanted, or removed by draining through a reservoir drain port. Decanting is recognized as a smart step, if available, even when using a vacuum dehydrator to increase the water removal speed. Emulsified water is water that has blended with the oil giving the oil a cloudy or milky appearance. Even though emulsified water in oil is in a free form, emulsified water will mostly remain in this blended state and not "fall out" or separate and settle on the bottom like free water. Emulsified water must be addressed. Water absorbing and coalesce technologies will have difficulties addressing emulsified water. Dissolved water is water that has been dissolved into the oil. Think of humidity, which is the measure of the amount of water dissolved in the air, or of sugar being dissolved into tea. As the temperature of the air or tea rises, the capacity for more dissolved water or sugar increases. With dissolved water the visual appearance of the oil looks hazy. Similarly, when the temperature of oil rises, the capacity to absorb water rises, but to a point. Any extra water cannot be dissolved and is free floating with the oil. We then call this water free water. After all free and emulsified water is removed, the vacuum dehydrator then focuses solely on dissolved water. By this time, the vast majority of water in the system has already been removed. Removing dissolved water is a slower process. A vacuum dehydrator is a total water removal machine, designed to be attached to an online or offline system/reservoir/barrel to remove all free & emulsified & dissolved water to as low as 20ppm. The following example demonstrates the removal of water contamination from (Castrol VG32) oil by a FA-ST Vacuum Dehydrator. 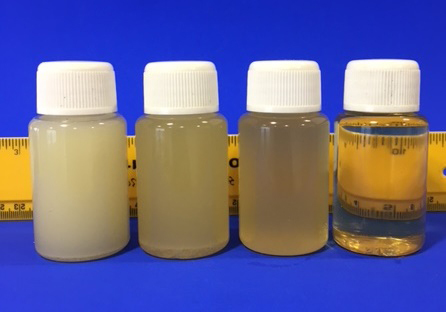 The image shows the starting point of 7.5&percnt; water contamination (75,000ppm) to finish point of <50ppm (from left to right). 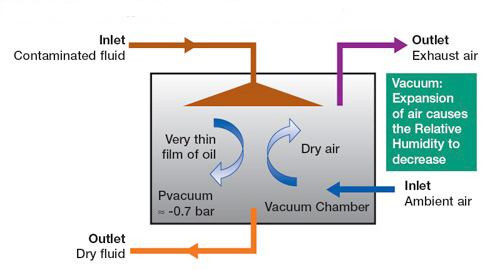 The vacuum dehydrator heats the oil (approx 60°C) and draws a vacuum (18-27”Hg) on the oil. Raising the temperature while drawing a vacuum causes water to flash to steam at a temperature low enough not to cause thermal breakdown of the oil. At sea level, water flashes to steam at 100°C (boiling point of water). The target zone for vacuum dehydration is 50-60°C, but the oil type will dictate this temperature. A very stable synthetic oil may require a hotter temperature than a standard mineral oil. Draw a higher vacuum to flash water to steam at a lower temperature (keeping in mind a higher vacuum is slower water removal than lower vacuum, so we balance between low temperature and water removal rate). The dehydrator works on all oils from mineral base to synthetic, gear oils with high viscosity and transformer oils, ranging up to ISO VG1000 oils. It’s guaranteed to remove the unwanted water in your system to a target of <100ppm and further if needed. There are other ways to remove free water from the system, such as water-absorbing filter elements which we also use and coalesce technology on limited oils without aggressive additive packages. 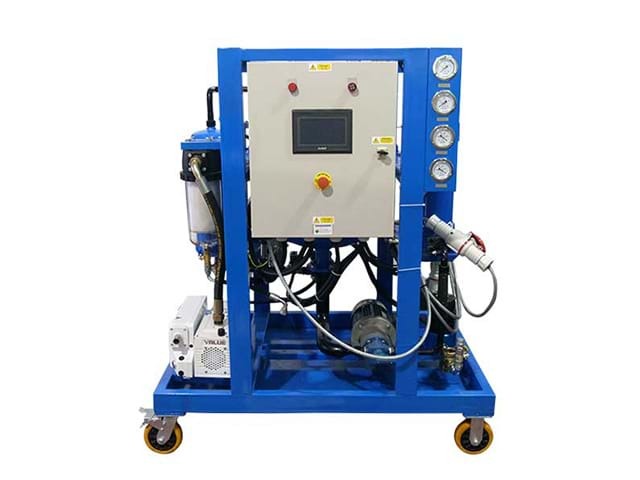 However, to possess the capability to remove water from every oil regardless of additive package or oil type or viscosity (up to ISOVG1000), the vacuum dehydrator is the most cost effective on large volumes of oil. After dehydration our water absorbing elements are used to give the oil a final polish and to remove particulates to ensure the oil is clean and dry. We welcome enquiries and can accept customer’s oil at our premises for water removal and filtration to exceptional cleanliness levels. The dehydrator unit will process 1200 litre per hour and can economically viable remove up to 70% water saturation. To date most of the oils that we have cleaned have shown from 0.5% to 8% water content. The FA-ST dehydrator is run on 3 phase electricity and it was designed, and purpose built to fit inside our service van so that it could be taken to customers sites if required. Due to the technical nature of this unit it is only available to hire with our operator. For long term hire we would offer training for self-operation.